As the odds on Gary Neville taking charge at Fulham tumbled on Tuesday, the bookmakers - for once and along with everyone else - were looking in the wrong place. The 40-year-old former Manchester United and England defender, part of manager Roy Hodgson's backroom team with the national side, was finalising details of his surprise appointment as head coach of La Liga side Valencia until the end of the season. Neville, who replaces Nuno Espirito Santo, will not be in charge when Los Che face Barcelona in La Liga on Saturday but will be in the technical area when they host Lyon in the Champions League next Wednesday. The new Guardiola? Listen to one journalist's opinion on 5 live. Is Neville ready for Valencia challenge? Neville's decision to move away from television punditry, where his forensic analysis has marked him out as an outstanding exponent of the art, into coaching is the clearest signpost that he sees his long-term future in full-time management. Neville's established relationship with many of England's younger players has been beneficial to his position as assistant coach. And no-one could accuse him of making an easy start. No easing in down the leagues. Not only straight in with a club of rich pedigree and ambition, but also abroad. It is a sign of Neville's confidence in himself that he has accepted the challenge at the Mestalla. And in many respects he has served the perfect apprenticeship to start this phase of his career in such pressurised surroundings. He spent 19 years under the tutelage of Sir Alex Ferguson, arguably Britain's greatest manager, at Manchester United, winning 20 trophies and establishing himself as a figure of significance and influence in a dressing room packed with powerful personalities. Neville also won 85 England caps and his coaching education has been rounded off even further by his association with the national team, where he has been at Hodgson's side along with Ray Lewington since his appointment in 2012. With England, he has worked alongside elite players and travelled to major tournaments such as Euro 2012 in Poland and Ukraine and the World Cup in Brazil last summer. Neville is the sort of character who will have been soaking up vital information like a sponge. It hardly takes someone close to Neville to work out that this is a man of strong opinions, convictions and deep football intelligence, as well as searingly high standards in all matters involved with football from his days at Old Trafford, where nothing but the best was good enough on and off the pitch. Listen to his punditry and read his column in a national newspaper and it is easy to detect a single-minded deep-thinker who will have the courage to put his plans and beliefs into practice, whether that is behind the scenes at Salford City - the non-league club of which he is co-owner - or in Spain with Valencia. He has not entered an easy arena, trying to revive a Valencia side who have been strong in defence but poor in attack this season, and who must beat Lyon in his first game to maintain an interest in the Champions League. They are also five points off the top four places in Spain, winning only five of their opening 13 league games, but by acting now Valencia believe Neville can correct that shortfall. He has to start his club career somewhere. He has served his apprenticeship and as with the rest of his career he will not regard failure as a palatable option. It is a daunting leap from punditry into coaching and management, but Neville is someone who always seemed destined to make his long-term career in the latter, even if this current time away from the studio turns out to be only temporary. Many modern pundits, such as Ruud Gullit and Alan Shearer, have had mixed careers in management. Alan Hansen, the celebrated BBC Sport pundit, made it plain he never once considered moving into coaching and, when offering any critique of managers, either on screen or in his website column, always made the point that any comment he made must be shaped by the fact he never took on the job himself. He was never over-critical of those brave enough to take on a job he never did himself. One of the questions asked of elite players who make the move into management is whether they can they cope with handling players who may not have the same drive, attitude and approach as themselves. Neville has his standards but will also be a realist. He will accept honest failings but not a lack of professionalism. He speaks the language of players so relating to them should not be a problem. Can Neville clear the language barrier? As David Moyes pondered his recent sacking from Real Sociedad, one of the criticisms aimed in his direction was that he had failed to grasp the Spanish language during his 12 months in Spain. Neville, for now at least, only has five months to make his message clear so he has to hit the ground running on and off the field. His brother Phil arrived at Valencia as a coach in July, having also left his job as a football pundit with BBC Sport. He has been having Spanish lessons to immerse himself in the culture so will no doubt be able offer early help, as will the Salford connection at the club. Peter Lim, Valencia's Singaporean owner, has a stake in Salford City, which Neville co-owns. He will, no doubt, make every resource and assistance available to make sure his new manager gets his thoughts across. Neville will also be a firm believer that football is a universal language and maybe even some of the technological and tactical wizardry he used in the television studio might help to bridge the barrier. 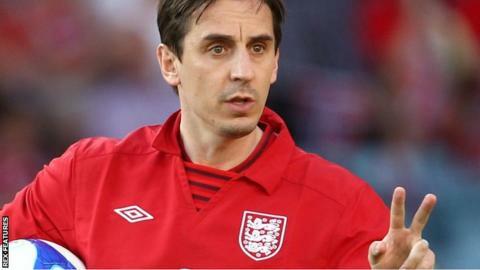 What next for Gary Neville? Neville has not yet got his feet under the desk at Valencia, but already the future is rich with possibilities should he make a success of his stint in Spain. If it does not work out, he has an open invitation to return to Sky, such has been the scale of his success since becoming a pundit. If he succeeds, then many doors will open, from staying in Spain to returning to England and perhaps serving clubs or even his country. There would be no shortage of suitors. England manager Hodgson regards Neville's move as "another string to his bow" and will benefit the national side as they prepare for Euro 2016 in France. If England fail to shine in France and the Football Association decides on a change of direction, then success in Spain could put Neville in pole position to succeed Hodgson, especially with Gareth Southgate blotting his copybook with failure at last summer's under-21 Euros. And what about Manchester United? Ryan Giggs would appear to be primed to succeed Louis van Gaal, whose pragmatic approach is drawing criticism from many supporters and former players such as Paul Scholes. A reunion of "The Class Of 92" - which would bring the Nevilles back into play - would be seen as the dream ticket in Old Trafford's line of succession and if he comes through this tough Spanish test with flying colours his stock will only increase.